Saving for a down payment and feeling confident that their investment will be protected remains a significant barrier for many would-be homebuyers. According to the survey, 81 percent of renters and 67 percent of homeowners believe that down payment protection would give people more confidence in buying a home. The dream of homeownership is alive and well, but despite the continued recovery of the housing market, Americans are still reluctant to buy a home, according to a recent online survey conducted by Harris Poll. Saving for a down payment and feeling confident that their investment will be protected remains a significant barrier for many would-be homebuyers, the survey concluded. Only 55 percent of renters are confident they will get a return on their down payment investment if they buy today, but sell their home within the next few years, the survey said. The survey supports the business model of ValueInsured, a company whose +Plus program safeguards buyers’ down payments and reimburses those funds in the event of a loss when they sell in a market downturn. Harris Poll conducted the survey on ValueInsured’s behalf, just a few months before the company plans to launch the +Plus program. According to the survey, 81 percent of renters and 67 percent of homeowners believe that down payment protection would give people more confidence in buying a home. About 63 percent of renters said they would be more likely to buy a home sooner if they could have the option to buy down payment protection. More than half of millennial homeowners said they would be more likely to buy a new home if they can have the option to buy down payment protection. 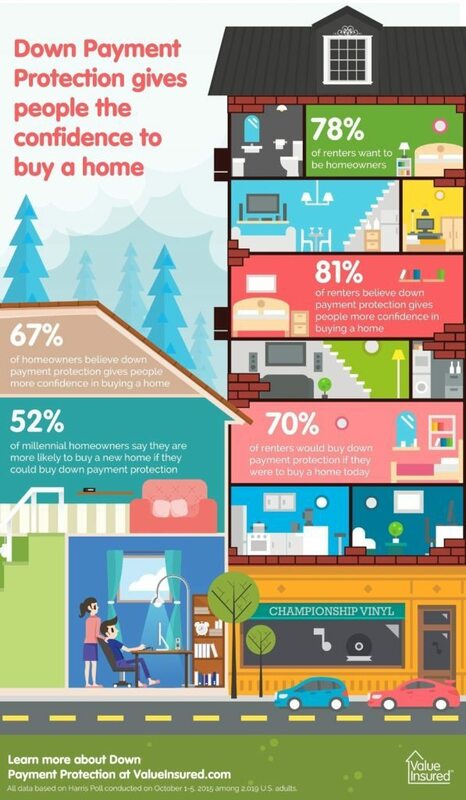 63% of renters said they would buy a home sooner if they could buy down payment protection. Who qualifies for the +Plus program? The +Plus program will be available to buyers of existing or new single-family homes in all 50 states after January 2016. Buyers who purchase the policy will pay a one-time fee at closing. Rates will vary depending on the buyer’s state, but on average, buyers will pay about $1,000 for the policy. In some cases, lenders may agree to pay for the coverage and charge the buyer a higher interest rate, which would increase monthly or other periodic loan payments. Other options include a seller paying for it, or a buyer’s agent paying for it. Coverage only applies if the sale price of the home is lower than the purchase price, and if the Federal Housing Finance Administration (FHFA) Home Price Index (HPI) for the homeowner’s state at the time of sale is lower than it was on the date he purchased the home. The payout is calculated as the lesser of the homeowner’s down payment; the actual equity lost; or the purchase price of the home, times the reduction in the homeowner’s state HPI. Some eligibility requirements apply. The +Plus program is underwritten by Houston International Insurance Group and reinsured by Everest Re Group Ltd.
Harris Poll’s survey, conducted online last month, polled 2,019 adults, 1,209 of whom were homeowners and 746 of who were renters. Harris Poll noted that the survey was not based on a probability sample and said no estimate of theoretical sampling error can be calculated.